As the grays and browns of late winter replace the snow, it is uplifting to look back on the amazing botanical garden I visited in September. I was in Maine for my birthday and, if that wasn’t present enough, my husband and son took me garden visiting to Coastal Maine Botanical Gardens in Boothbay, Maine, US. Even though I come from the mid-Atlantic, home to many of the best public gardens in the US, and have visited gardens all over the world, I was wowed by this new but impeccably executed garden by the sea. Coastal Maine Botanical Gardens opened officially in June of 2007 after 16 years of meticulous planning by an incredibly dedicated group of Maine residents and the talented experts they hired. After searching since 1991, this intrepid group purchased 128 acres of pristine land with 3800 feet of tidal shore frontage in 1996, using their own homes as collateral. An additional gift in 2005 brought the total to 248 acres and almost a mile of shoreline, saving it all from development. 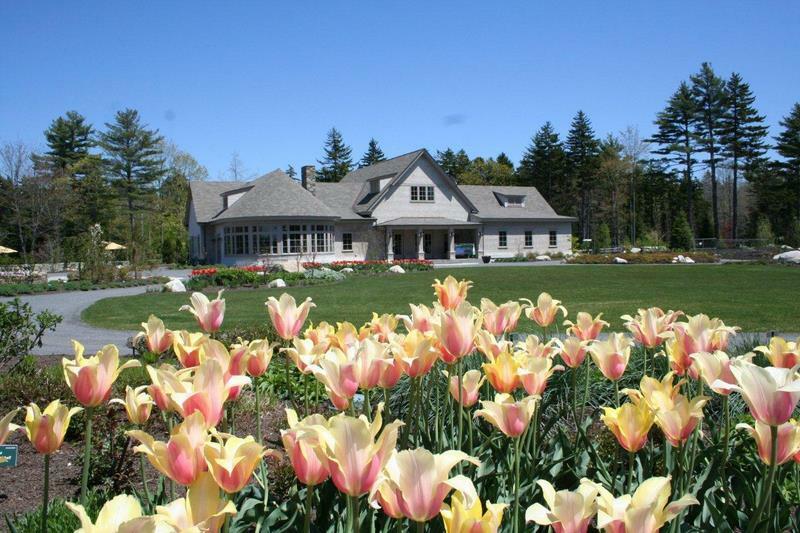 Planting began in 2001 and the impressive Maine cottage style visitor center (photo at top) opened in 2007. This summer saw the opening of the magical children’s garden (photo above) themed to highlight children’s literature with a Maine connection. Walking around the designed portions of the gardens was such a pleasure because both the overall design of each area and also the attention to individual details is exceptional. 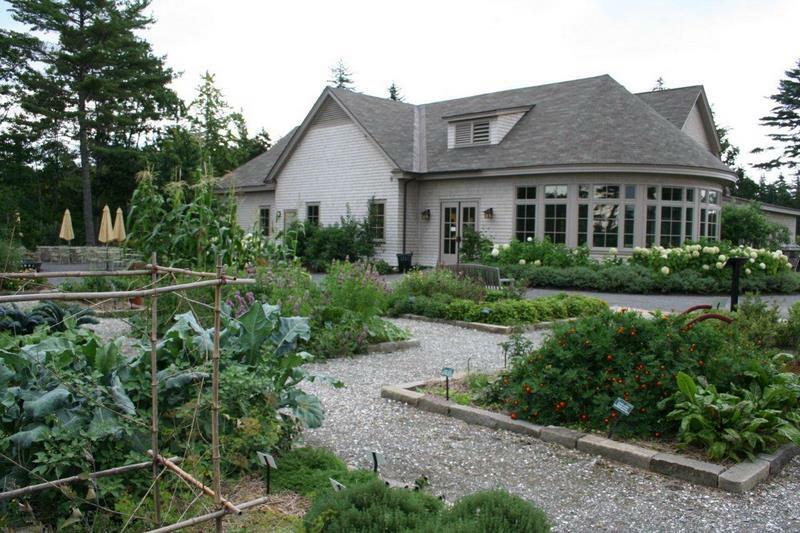 The light and airy cafe opens onto an elegant kitchen garden (photo above) planted with herbs, vegetables, edible flowers, berries, and an orchard of hardy heirloom apple and pear trees. 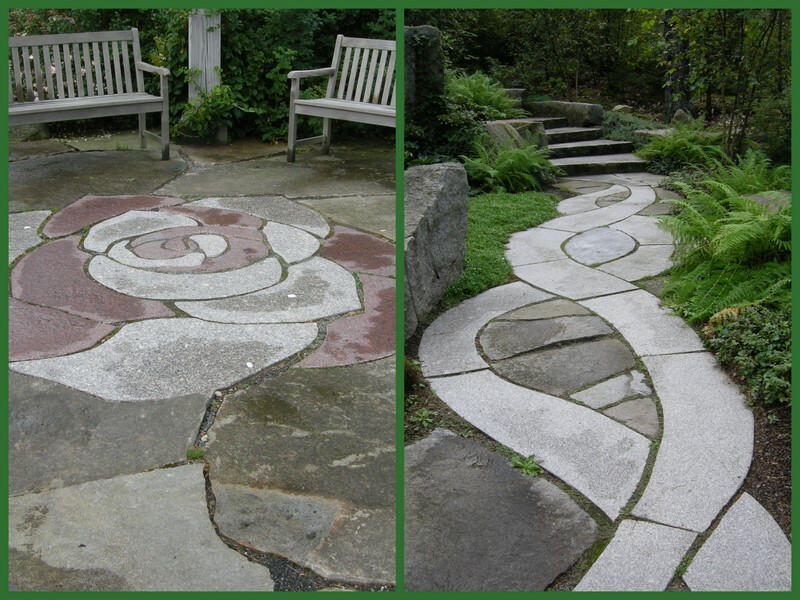 Creative and beautiful stonework graces every area of the 15 acres of ornamental gardens (see photos below). Each area of the landscape from the cottage style rose garden (photo above) to the more naturalistic rhododendron garden (photo below) was a treat for the eyes. 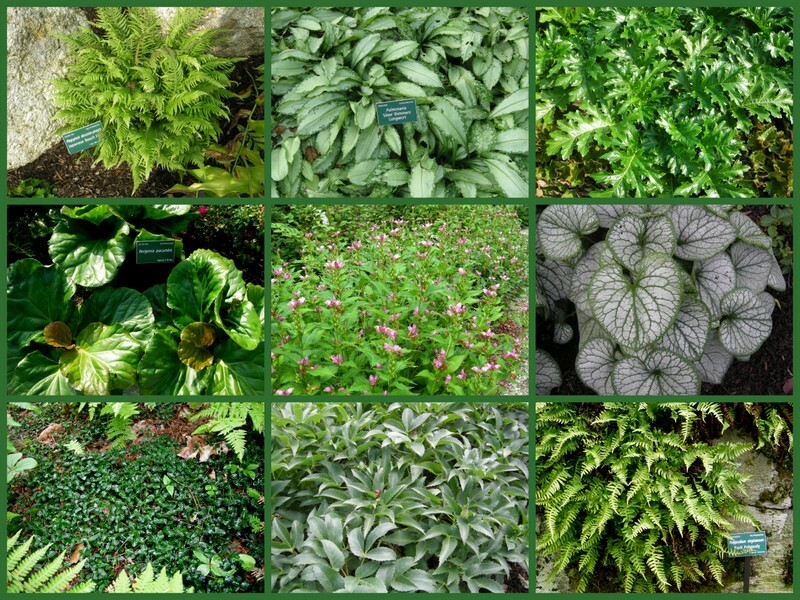 And each individual plant within these gardens was impeccably grown (collage below). Obviously I focused on shade plants! If that description isn’t effusive enough, what I treasured the most was my walk along the miles of trails showcasing the untouched waterfront and woodlands that are quintessentially Maine. The views of the tidal inlet are spectacular (photo of cove below). 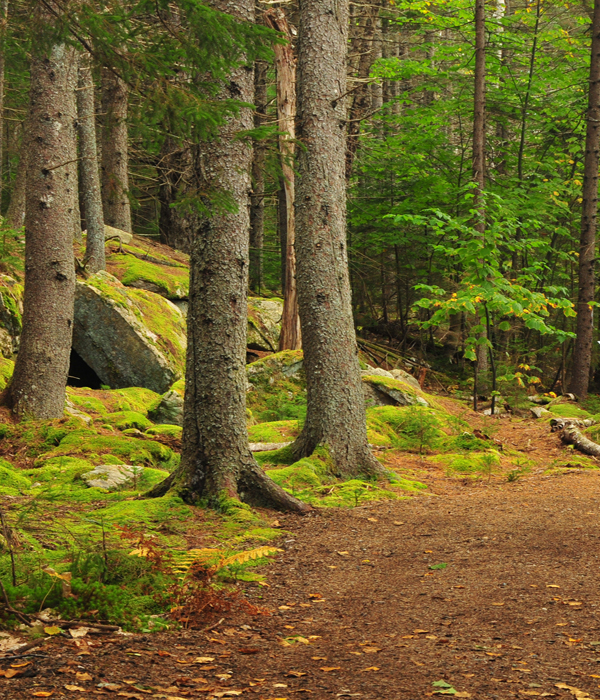 The pristine woodlands are something rarely found in the rest of the continental US (photo of trail below). 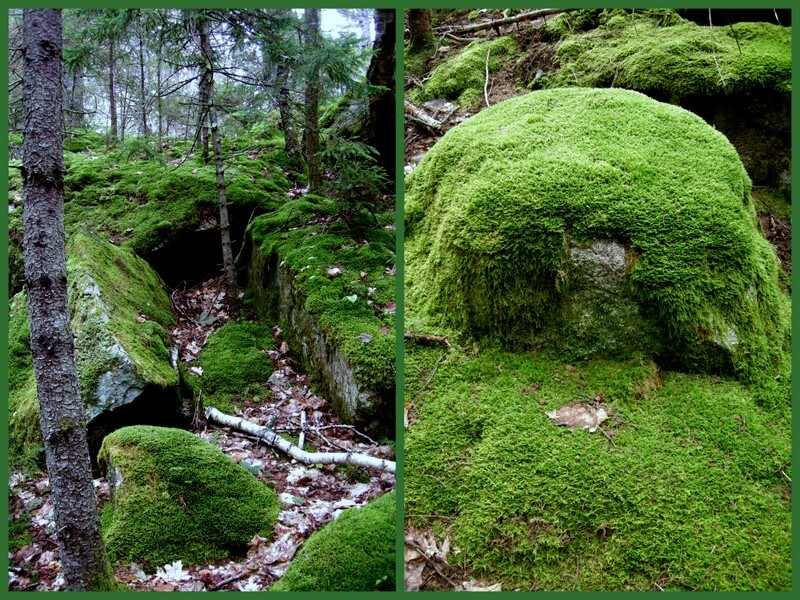 It is hard to imagine if you haven’t seen it, but every inch of the trails, woodlands, and especially the rocks is covered with moss (photo below). As you look closer, you realize that every rock holds a garden of its own more beautiful than any human, no matter how talented, could create (see collage below). 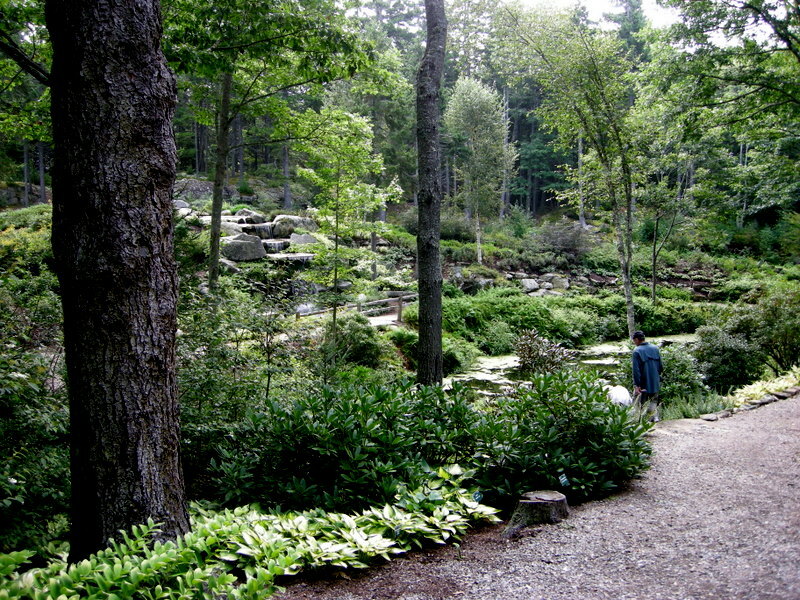 I would visit Coastal Maine Botanical Gardens just to see the magnificence of nature untouched. What Coastal Maine Botanical Gardens has accomplished in the short period of time it has been in existence is nothing short of remarkable. A beautifully designed and executed ornamental garden set like a jewel in a spectacular natural setting: it doesn’t get much better than that. Notes: If you want to know more about Coastal Maine Botanical Gardens and see more beautiful photos, click here. I have also added Coastal Maine Botanical Gardens to my sidebar under Places to Visit so you will always be able to find it. International visitors to the US should consider adding the State of Maine to your itinerary—one of the most beautiful places on earth. Every word that appears in orange on my blog is a link that you can click for more information. If you want to return to my blog’s homepage to access the sidebar information (catalogues, previous articles, etc. ), just click here. Nursery Happenings: I am currently accepting orders for snowdrops, including mail orders. For the catalogue and order information, click here. I am taking reservations for my Hellebore Seminars for the Totally Obsessed. For the brochure and registration information, click here. I have four spaces left for Charles Cresson’s Snowdrops and Other Winter Interest Plants Seminar. For the brochure and registration information, click here. This entry was posted on February 18, 2011 at 5:02 pm and is filed under garden to visit with tags Coastal Maine Botanical Gardens. You can follow any responses to this entry through the RSS 2.0 feed. You can leave a response, or trackback from your own site. This is one of my favorite things about blogs…that we get to visit gardens all over the world that we may never see otherwise. The photo just above your collage of the shade plants is wonderful as it really gives an idea of the size of the garden. Beautiful! Carolyn, this is a fabulous post! Thank you SO much for sharing this little piece of paradise with us! I really enjoyed your tour today. The photos that you credited are gorgeous. 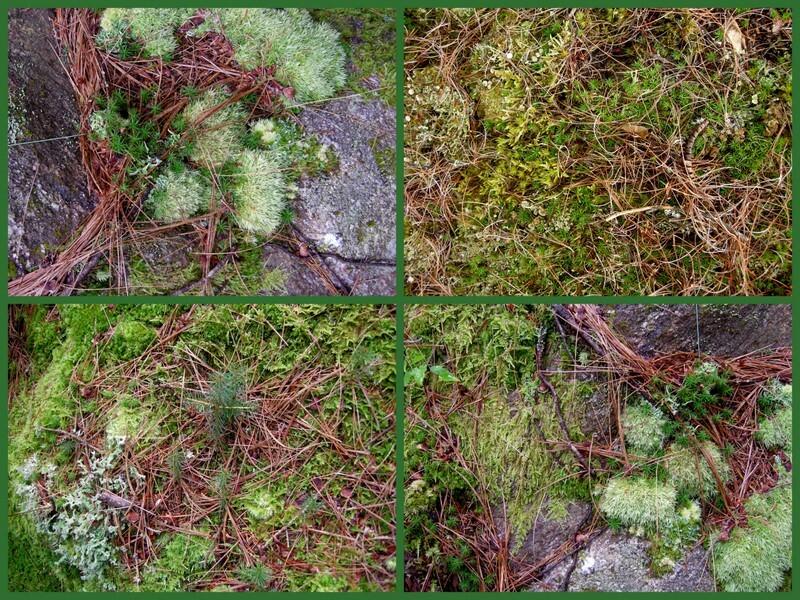 I think I was most taken by the moss images. It is like being in a magical place when a forest is covered in moss. Oh, Carolyn, this is my dream garden. What a wonderful way to celebrate a birthday. Huckleberry Cove and its mossy trail took my breath away! I have never been to Maine, and I have never heard of his wonderful place. I also love the patio with the rose motif. I would love to visit! I wonder if there is a book about this garden? Carolyn, I was very interested in your take on this garden. I visited a couple of years ago with a Master Gardener friend, and we were disappointed. I did love the wooded area along the cove, but so much of this garden seemed to be about growing plants that weren’t really suitable for the spot they were planted in and then having complex irrigation systems to keep them thriving. I had the sense at the time that the CMBG hadn’t quite figured out yet what it’s mission was. Was it just to have lots of pretty plants growing in a pretty place, or did it have a more educational function (what I would expect of something that calls itself a “botanical garden”)? I would have loved to see better plant labeling, more emphasis on native plants, and education about planet-friendly gardening practices. Thanks, Carolyn. After I read your post, I visited their web site and found the emphases I was looking for when I visited there in 2009. I will try to make some time to get out there again this summer. Thanks for getting me to take another look. I was wondering what Jean’s take on this would be … how wonderful that you found a Botanical garden when you went Carolyn! A good news story to balance Lost in the Landscape and an arboretum going going? Oh, Carolyn, Thank you for giving me yet another reason to visit Boothbay! Lovely show gardens and stonework. I am really drawn towards Huckleberry Cove trail! Looks like a wonderful place to spend a few hours! Carolyn that is truly wonderful! That a group of residents would band together to create such a wonderful place, combining protection of wild habitat with beautiful and inspirational cultivated spaces, is so heartening. Thank you for sharing your visti. I love the stone paths, actually I love everything you have shown us, but what I most covet is the kitchen garden. What has happened to me! 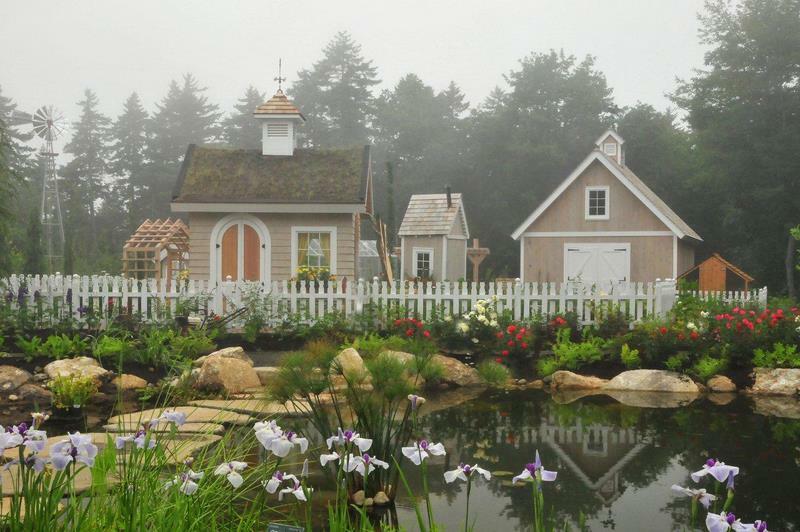 My garden club will be visiting this and other Boothbay area gardens in June – I won’t be able to join them, but it looks like a beautiful destination and a great story. Thank you for the tour. We have friends nearby, and this is now on the list when and if we ever visit them again. Thank you for showing and sharing those impressive beautiful gardens, cant pick one favourite, I love all of them! Thnak you Carolyn, for the virtual visit in your post, never the samer as in reality but better than nothing. Carolyn, what a garden!! I haven’t been to Maine before but it’s not too far from where I live and now I have an extra reason to go. I love that they’ve kept what looks like a large area completely untouched. Nobody does gardening better than mother nature. Carolyn, The Children’s Garden looks so enchanting. I will definitely be adding this garden to the list of places to take my little garden girls! Thank you so much for sharing your trip with us!! Dear Carolyn, I must admit that generally I avoid Botanical Gardens, rather thinking that they are horticultural zoos. However, the Coastal Maine Botanical Garden that you feature here seems very different indeed. As you say, it clearly has an impressive plant collection but it manages to be much more than that. I love the way that more formal areas are ncorporated into the whole as well as having wonderfully informal areas to explore. Perfect! Stunning gardens, thank you for the exceptional tour, Carolyn. Would so love to visit! Hi there – what a lovely walk about in my dreary winter weather here – really uplifiting – thank you! These pictures are beautiful! We have been trying to decide on a place to visit soon. Now I may have to add Maine to the list. I am going home to Maine this summer and this garden is on my to see list. My mother saw it last summer and enjoyed it. I first learned of it when Mr. Cullina came to Nashville and spoke to our perennial plant society group. I so enjoyed his talk! He has a few books out too and is quite talented so I’m not surprised he built this garden up fast. Your post is wonderful and gives me an idea of what to see. I surely wish to see all the moss. Never seen so much green before! It’s awesome and how wonderful you were able to go to Maine and visit for your birthday. I cannot ever think of a better place than Maine for the summer and early fall. 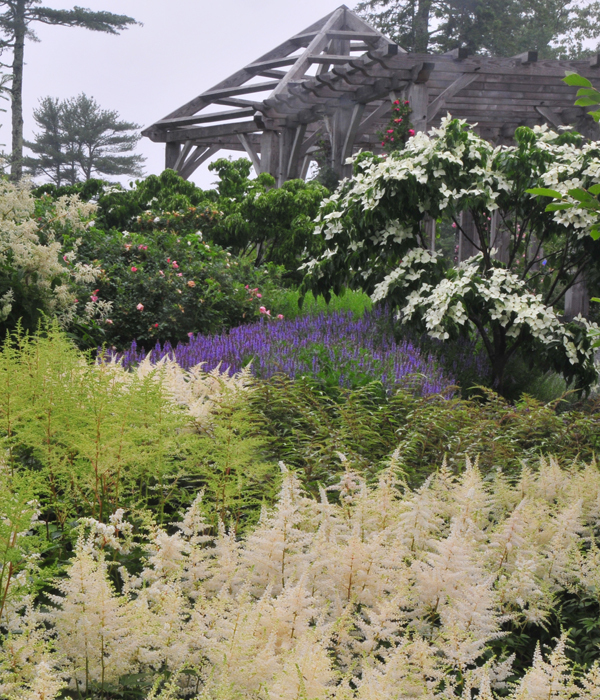 That astilbe and dogwood is magnificent too! Carolyn, the gardens in Maine, absolutely beautiful and Huckleberry cove, wow. I have to say, no garden can match the wonders of mother nature. breathtaking, I have never been to Maine. It looks Old World to me, or what I image Old World would look like. Being an outdoor person and spending a great deal of time in the woods, the last shots were my favorite. I want to walk through a forest like that. I want to smell that air. From your description and pictures it is easy to see what a beautiful garden this is. The moss covered forest is magical. Carolyn I’ve enjoyed my walk through your lovely post this morning. My heart was yearning for a little green and I found it here in abundance. The Huckleberry Cove Trail surely reminds me of magical places I’ve visited in the Pacific Northwest when we lived there. We now live in a high desert climate, with not so many places to find moss. I’m also enamored with the concept of so many working together to create such a place of beauty. Certainly an idea worth duplicating. I am glad I could provide you with some greenery on what is probably a snowy day out there in Utah. People in Maine tend to work together really well to create all kinds of magical things. Being a big kid myself, I love children’s gardens. And this one in Maine just looks charming. 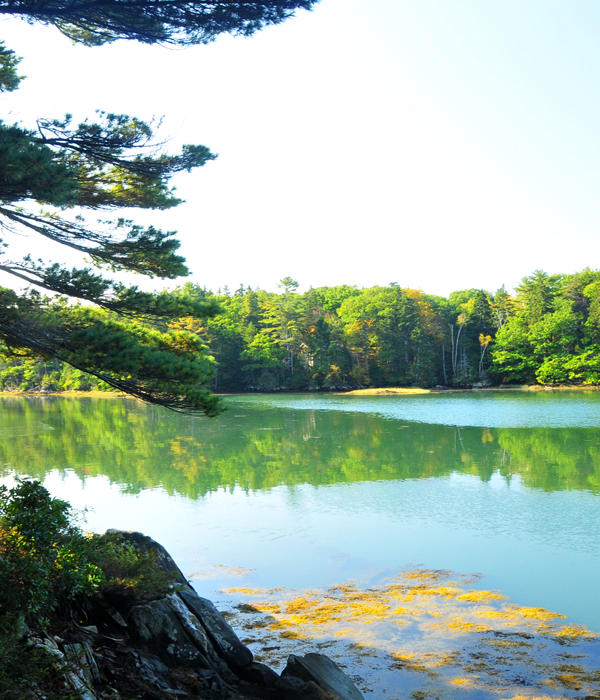 Awe Carolyn, Coastal Maine Botanical gardens are stunning! One of my favorite things to do is walk through beautiful gardens! Thank you for sharing your beautiful photos so I could virtually experience the gardens as well. One day I would love to visit this area. How can anyone deny that God doesn’t exist when they see such beautiful creations??? One other note, I have Anemone nemorosa viride which is entirely green as well as A nemorosa Robinsonia. If you are interested in adding them to your collection, let me know. I can easily spare a few for you.